This lovely cake inspiration comes from The Essential Pepin, adapted liberally to our food needs and tastes. It is gloriously simple and fun to make with children. Using the whole plums is stunning and dramatic, but after the first cake I decided that sliced plums – plenty of them – would work better for us. With plum slices you can ensure more plum with each bite of cake. The cake is not exceptionally sweet, which I appreciate because it then qualifies as breakfast food or travel food. We had slices of it boxed up for a one-day road trip. The boys enjoyed theirs with milk. Amanda and I washed our plum cake down with hot tea. In making this recipe, choose a plum that holds together fairly well when cooked. Santa Rosa is a good choice. Bob’s gluten-free baking flour works in this recipe. That is one of my tweaks on Pepin’s work. Butter the bottom and sides of a 9-inch spring form pan. Place the flour, sugar, baking powder and almonds in the bowl of a food processor. Process until the almonds are mealy. Add the butter slices and process until the butter is also mealy-looking. In a small bowl whip together the eggs, milk and vanilla. Add the egg mixture to the dry ingredients in the food processor. Pulse a few times to blend the wet and dry ingredients. Do the pulsing as little as possible to protect the texture of the finished cake. Spread the batter evenly in the buttered spring-form pan. 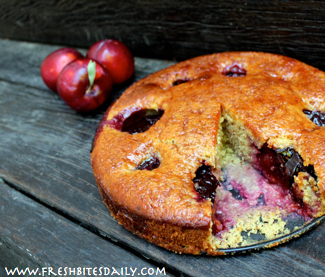 Arrange the plum slices on top of the batter with the skin-side of the slices facing up. Press the plum slices half way into the batter. Place the cake on the middle shelf of your oven and bake for 50-60 minutes at 350 degrees. The crust should be lightly browned and a toothpick inserted into the cake should come out clean. Your kitchen will smell heavenly! Allow the cake to cool for about ten minutes. Then, with the cake still in the pan, brush the cake top with the thinned-down plum jam. This adds a jewel-like glaze and a bit more bright flavor. For an adult dessert, thin the jam with plum liqueur or brandy. Carefully run a knife around the edge of the cake to loosen it from the sides. Leftovers keep best in the refrigerator in an airtight container. 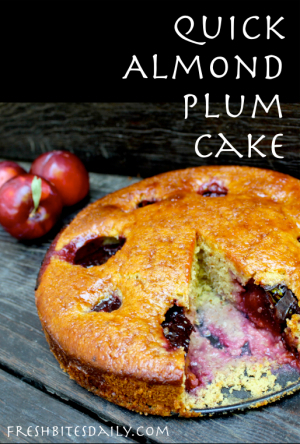 2 Comments on "Quick Almond and Plum Cake"
I love plums! I’ve never baked with them. I’ll have to give this a go. Thanks. I’d be extremely blessed by your participation and promotion of joyful gluten free living.